The Sarvari Research Trust (SRT) is the organisation that breeds new, disease resistant varieties of potato that are traded by Sarpo Potatoes Ltd (SPL). At its core is one of the UK’s leading experts on late blight of potato, Dr David Shaw. 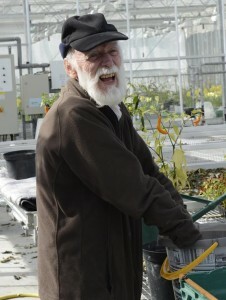 David retired as a lecturer and researcher in Genetics and Plant Pathology at Bangor University in 2002 to begin the work that led to the formation of the Trust. The Trust aims to make potato growing globally less dependent on chemical and energy inputs by producing and promoting low-input varieties. Ideally these should be blight and virus resistant, capable of smothering weeds and have natural dormancy that prevents early sprouting in store. The Trust would be happy to make some of these varieties available to developing countries where blight and virus are major problems and where subsistence farmers cannot afford expensive chemicals. SRT is based at Henfaes Research Station, the farm owned by Bangor University in North Wales. Henfaes is wedged between the Carneddau mountains (part of Snowdonia) and the sea, near the village of Abergwngregyn on the beautiful North Wales coast. Using its extensive experience of running trials to assess blight resistance, the Trust is able to offer blight assessments of new and existing varieties of both potato and tomato to commercial companies who are developing their own varieties.